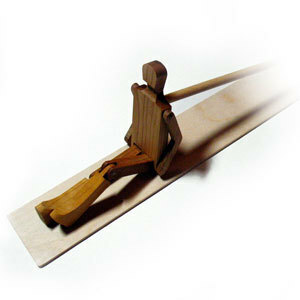 The limberjack is a dancing doll that keeps rhythm as you bounce the dance board. Known by a variety of names, the limberjack harks back to the British Isles a few hundred years ago. It's still a favorite with kids everywhere! This one by Jack Brown of Vermont is made of solid cherry and is the best limberjack Jack has found. Best for two and four beat rhythms.